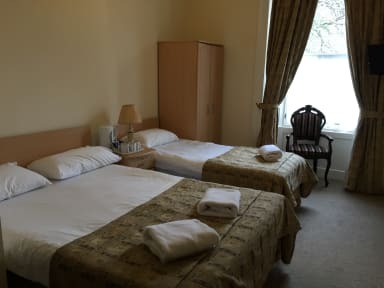 Merith House Hotel i Edinburgh, Skottland: Bestill nå! 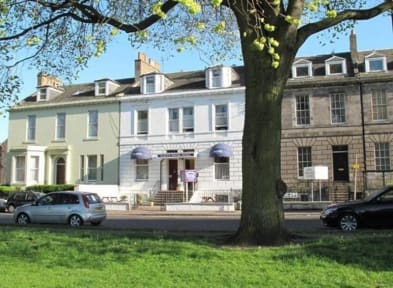 The Merith House Hotel in Edinburgh overlooks the beautiful Leith Links Park (the first golf course). Bus stop just outside takes you to Princess Street (city centre) in 5 - 7 mins. We offer free street parking. All Rooms Have LCD TVs (over 50 channels), tea/coffee making facilities, free Wi-Fi, Fresh soap, towel and linen is provided in every room. All are comfortable and practical (room sizes vary) and are maintained daily. Front-facing rooms have lovely views over Leith Links Park where the original rules of golf were drawn up and played over five holes back in the 15th Century. We don't have a bar but there are many bars and restaurants, both trendy and traditional, within walking distance. Ocean Terminal, Royal Yacht Britannia, Edinburgh Castle, Holyrood, Scottish Parliament and Princess Street are all nearby. Please Note Rooms with Shared Bathrooms DO NOT include Breakfast. En-suite rooms include a complimentary continental breakfast. Check-in between 14.00 - 21.00. Please specify your arrival time when booking.